With Rick McDonald at the piano of the 1924 speakeasy, Bill’s Gay Nineties, last Thursday night, the crowd was singing, the joint was jammed, and dozens of hungry diners were climbing the stairs to sit in the gaslight glow of the second-floor dining room, packed with carefully preserved playbills, theater cards, and lithographs of the men and women who built the foundation of the American theater and founded the form that is American popular entertainment — George M. Cohan, Buffalo Bill Cody, Enrico Caruso, Tony Pastor. The list goes on and on. This temple to theater, created in the 1920s by the original Bill’s wife, a former Ziegfeld girl, is about to close on March 24. How fortunate that we met a master vaudevillian and Coney Island sideshowman, Todd Robbins, who (between a few tableside magic tricks) walked us through the history of the place, the legacy of the hundreds of show people gazing down on our dining table, and stories of how George Burns, Jack Benny, and the pantheon of American entertainers found solace around Bill’s piano (just like us) in decades past. How comforting to be amongst other time-travelers in this unique and soon-to-be-gone living, breathing archive of the last 150 years of American entertainment. Take a walk around Bill’s with us. 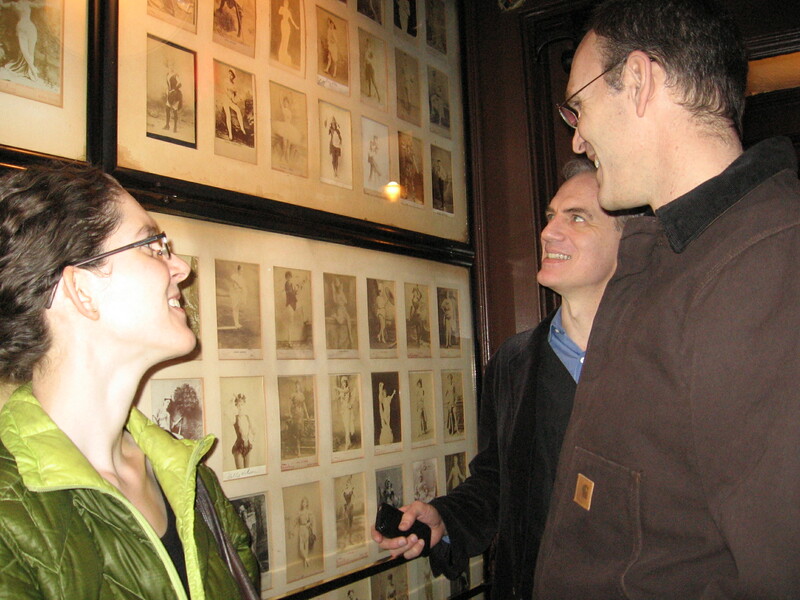 These Flickr photos are sometimes a little blurry and hard to make out, but they seem appropriately evocative for a room, history, and gathering spot that will soon be like the celebrities on these walls…fading but important memories of spectacular, vibrant nights spent singing and sharing the high points of the latest Broadway debut. This entry was posted in History, Museums, Theater and tagged culture, history, museums, theater by mssusanb. Bookmark the permalink.